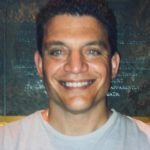 This post is part of the Response to “Hate Mail” from an Israel-Hating Conspiracy Theorist series dealing with biased and incorrect claims made against Israel. The first claim you often hear from Israel naysayers is one of the easiest to debunk. They love to claim that “before 1948 Muslims Christians and a minority of Jews lived in Palestine in harmony”. This would be accurate, but only if you ignore more than 150 years of actual history. You would also have to turn a blind eye to over a thousand years of Arab attacks, massacres and pogroms directed at Jewish communities throughout Arab conquered lands. In 1834, the Arabs in Safed rioted and conducted a massive pogrom directed at the Jews of Safed in the central Galilee. These pogroms and massacres directed at Jewish communities spread to Ramla, Lydda, Jaffa, Acre and Tiberias, where Christian members of the local clergy noted that the perpetrators attacked and viciously robbed the Jews, who lived in these towns, of all of their property. In 1920, 1921, 1929, 1933 and 1936, Arabs in British Mandatory Palestine rioted with the express intent – as urged by Nazi Collaborator and Mufti of Jerusalem, Haj Amin al-Husseini – to murder the Jews. And, they murdered Jews by the dozens and injured hundreds in these massacres. 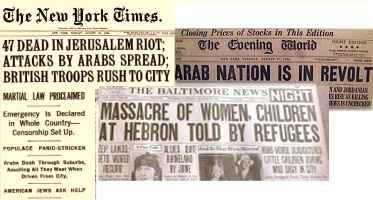 In fact, in the 1929 riots all of the Jews of Hebron (many whose families had lived in Hebron for centuries) were either murdered or ethnically cleansed from their homes. Notably, these riots occurred at a time when there were massively increased economic opportunities in the region. Increased economic opportunities for all of the inhabitants, which resulted in many Arabs migrating to the region from Syria, Lebanon, Egypt, Iraq etc. And, it was Jews who created these opportunities. They included the establishment of the city of Tel Aviv (in 1909) as well as many other cities and farming communities. Jews also established the Hebrew University in 1918 (where today Jews, Arabs and numerous other ethnic and religious groups all study). And it was Jews who began publishing in 1932 the Palestine Post (now called The Jerusalem Post). Other opportunities included the opening of the Palestine Philharmonic (now called the Israel Philharmonic) and the formation of the first labor union in Palestine (the Histadrut) in 1920. Despite economic opportunities and increased prosperity in British controlled Palestine caused by the above referenced Jewish economic, academic and agricultural activity, local Arabs were spurred by their ideology (both Arab Supremacist and Islamist Supremacist) and by their corrupt hate-filled leaders (like the Nazi collaborator, Haj Amin al-Husseini) to hate Jews, who throughout the last 1300 plus years of Arab history were relegated to “dhimmi” (second class) status in Arab conquered lands. Thus, the Arabs in Palestine were easily motivated to riot, attack, and murder Jews. Just as Arabs did outside of Ottoman and British controlled Palestine during the Farhud Riots in Baghdad in 1941, the “Blood Libel” massacre of Jews in Damascus in 1840, the 1912 massacres of Jews in Fez, Morocco, or the 1941 Anti-Jewish riots in Tripolitania (where over 140 Jews were murdered during a pogrom that lasted two days and left 4000 Jews homeless and 5 synagogues destroyed). In fact, in the 19th Century alone, when much of the Middle East and certainly all of the Levant was under the control of the Ottoman Empire, pogroms against Jews in the Middle East and North Africa were commonplace, including in Aleppo (1850, 1875), Damascus (1840, 1848, 1890), Beirut (1862, 1874), Dayr al-Qamar, Lebanon (1847), Jaffa (1876), Jerusalem (1847, 1870 and 1895), Cairo (1844, 1890, 1901–02), Mansura, Egypt (1877), Alexandria, Egypt (1870, 1882, 1901–07), Port Said (1903, 1908), and in Damanhur, Egypt (1871, 1873, 1877, 1891). So much for the notion that before 1948 Jews and Arabs lived in “harmony.” Due to Arab/Islamist Supremacist dogma and indoctrination, as well as Jews being labeled for centuries as less worthy and even treacherous dhimmi, the life of Jews in Arab controlled lands was always (at best) one of a second class citizen – who needed to know his or her place. And even then, they often did not leave us in peace. You forgot all the anti-Jewish pogroms of the 19th century in pre-French colonization Algeria. Look into it. My family barely survived the one in Mascara by the troops of Abd El Khader (during the French colonization). No. I did not forget about them. I only gave exemplars. Sadly, the number of Arab and Islamist supremacist inspired attacks on Jewish communities in Arab controlled lands starting in 627 AD and continuing through 1948 AD are way too many to list in one short article.